Hearts have confirmed the departures of Ruben Palazuelos and Ismael Bouzid but agreed a new contract with midfielder Ryan Stevenson. Stevenson has signed a one-year extension, having joined from Ayr United in January 2010. The 26-year-old made 33 appearances and scored seven goals last season. 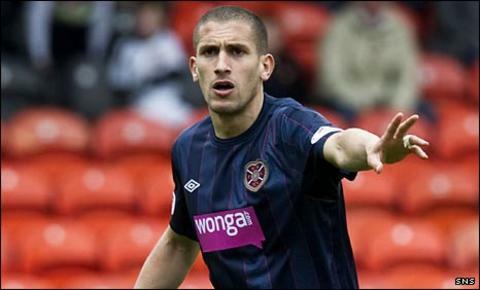 Algeria international defender Bouzid leaves after two years at Tynecastle, having previously played in Turkey for Ankaragucu. Midfielder Palazuelos joined the Edinburgh club after departing Gimnastica Torrelavega in his native Spain in 2007. Both had become first-team regulars at Tynecastle. Manager Jim Jefferies told the Hearts website: "Ryan was my first signing when I came back as manager and he has taken his chance well. "It was a big step up for him and he got into the team quicker than he maybe thought due to the injury situation at the time. "We tried him further up the park as one of the strikers and he did extremely well and chipped in with a few goals. "He is still young and can get better and it's up to him to go and establish himself. "He is a terrific lad. He maybe took a bit of criticism in some games, but he showed sheer determination to prove he is capable. "I don't think anyone could complain about the effort he puts in." Also departing Hearts are Polish defender Dawid Kucharski, who arrived after departing Lech Poznan in 2009, midfielder Paul Mulrooney, who was farmed out to Brechin City and Clyde last season, and striker Jamie Mole, who failed to become a first-team regular and had various loan spells during his time at Tynecastle.